Do not apply to known sensitive plant species such as impatiens flowers, fuchsia flowers, hibiscus flowers, some rose flowers, ornamental olive trees, or some carnation varieties without prior testing. Application Instructions: Garden Safe Brand Fungicide3 Concentrate is an effective fungicide for the prevention and control of various fungal diseases including powdery mildew, black spot, downy mildew, anthracnose, rust, leaf spot, botrytis, needle rust, scab, flower, twig and tip blight, and alternaria. As a preventative, apply Garden Safe Brand Fungicide3 Concentrate on a 7- to 14-day schedule until disease development is no longer present. To control disease already present, apply Garden Safe Brand Fungicide3 Concentrate on a 7-day schedule until disease pressure is eliminated. Then continue spraying on a 14-day schedule to prevent the disease from recurring. To prevent rust leaf spot diseases, anthracnose and scab, begin applications at the first sign of spring budding. To prevent powdery mildew, apply in midsummer or when disease is first detected. Continue applications until disease pressure no longer exists. Mixing Instructions: Mix Garden Safe® Brand Fungicide3® Concentrate at the rate of 2 tablespoons (1 fl oz) per gallon of water. Thoroughly mix solution and spray all plant surfaces (including undersides of leaves) until completely wet. Frequently mix solution as you spray. 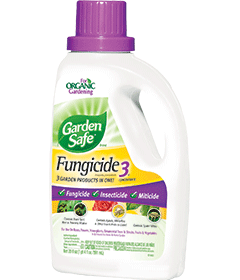 Mixing Instructions: Mix Garden Safe Brand Fungicide3 Concentrate at the rate of 2 to 4 tablespoons (1 to 2 fl oz) per gallon of water. Thoroughly mix solution and spray all plant surfaces (including undersides of leaves) until completely wet. Frequently mix solution as you spray.